Pic Scatter is by far the easiest. You'll need to give access to your likes, photos, and photos shared with you. Then you can create a montage cover showing a group of your friends or some of your likes. You can also use a specific photo album. But no matter what you choose, make sure you have enough there for Pic Scatter to choose from, to prevent repeating of images. Pic Scatter is free, but contains branding in the image. It's a super low lifetime fee of $1.50 to remove the branding, and it also gives you access to filters, instant uploads, and downloading images to your desktop. Unlike the above option, Timeline Cover Banner is totally free and does not contain any branding. It's not as simple, but if you want total control over your Facebook Timeline's cover image, this will do the trick. Their tool lets you upload any image (or images) of your choice, which you can then edit or add text to. You can also select from one of many free background images in their gallery. Once you've perfected your cover image, it will download right to your desktop. The big plus here? There's no need to connect via Facebook! CoverJunction is a place to both create and share cover images. To create one, you'll need to only give up your photos and email address when connecting to Facebook. You have very limited options when creating one though; you can only upload an image and reposition or resize it. This is mostly for those who've created a unique one for sharing. One you've created it, it's available to everyone, not just you, and even if you revoke CoverJunction's privileges to your Facebook, it will still be listed on their site. If you want your cover image removed, you'll need to email them. There is a cool mystery cover image called "My most liked photo" that you can choose, only you won't be able to see what it is until you upload it to Facebook. There's also a top friends version. This is my least favorite of my favorites. Unlike Pic Scatter, CoverCanvas wants access to more than just photos, which is always a negative for me. And the results? Not that great. You can generate montages of your profile pictures using a large amount of templates, but I couldn't find any I really liked. Most I thought were messy. Now, the 'name only' covers are more impressive. Very tidy, which is why it's on this list. The last option is a photos and name combo, which again... the designs are kind of messy, but there's a few keepers in the bunch. It all depends on your style and what images you actually have in your profile photo album. There are plenty of other options out there, but the four above are my favorites. If you want to try out more, there's always myFBCovers, FaceItPages, j4 Timeline Covers, etc. 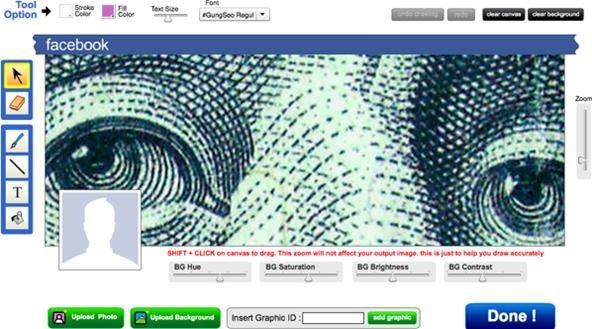 There are also sites that provide just stock cover images, like FaceCoverz, MyFacebookCover, and CoverPhotoz. You can also create your own stylized ones in Photoshop; here's some instructions on doing so. Thanx for sharing nice Websites list for FB Covers... i was using http://www.bhmpics.com/facebook_covers.html for my FB Profile but now i have lot od choices to make my profile looks great. Thanx again..
Do you know how to embed a link to the timeline cover photo? I'm working on a new cover for my company's FB page but I want it to link to a page on our website. There's something called ThingLink you can try. I've never used it, but apparently it will let you embed links in images for use as your cover photo. And it's free for basic individual and business use, though it'll cost you if you want more options. I personally use the Quotes Covers Maker from Facegarage which can give very cool results. But I just discovered CoverJunction wich is also very cool.